The Freightliner LLC Truck Company is trusted with some of the most respected names in the delivery, motor home, and bust industries. The Freightliner LLC Trucks come with a Freightliner Custom Chassis Corporation and manufactures premium vehicle chassis for walk-in cabs, motor homes, school buses and commercial buses. The Freightliner LLC Trucks was established in 1995, Freightliner Custom Chassis Corporation (FCCC) has experienced significant growth and today it’s a leading chassis producer for a variety of industries. Nearly two-thirds of all walk-in diesel van chassis sold today are made by the FCCC. It is known as the world’s largest manufacturer of diesel walk-in van chassis. Although the FCCC is just one of the many things that Freightliner LLC Trucks, the entire industry within Freightliner LLC Trucks is one of the best in the world. 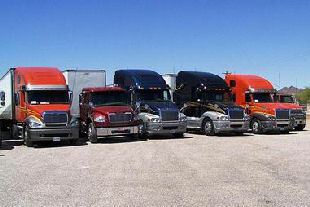 Class 5-8 trucks are manufactured by Freightliner LLC Trucks and serve a wide range of commercial vehicle applications. Its commitment to innovation, technology and responsive customer relationships makes it easy to understand why Freightliner LLC Trucks is the best-selling brand of heavy-duty Class 8 trucks in North America, and maybe the world. Long-haul highway vehicles include the ultra comfortable and aerodynamic Cascadia, the efficient and reliable Columbia, the technologically advanced Century Class S/T and owner-operator favorites, the Coronado and Classic/Classic XL. Freightliner LLC Trucks is committed to producing the most advanced, efficient trucks on the road today, but truck building is just the beginning of this current commitment. The service after the sale that forges loyalty between customers and the Freightliner brand is the most important of all services. With more than 350 dealer locations total, and many of them open 24 hours a day, seven days a week, eight strategically located parts distribution centers and a 24 hour hot line for roadside assistance, Freightliner LLC Trucks helps keep drivers out of the shop and onto the road where they belong. Mercedes-Benz Trucks: Transport Goods in Elegance!